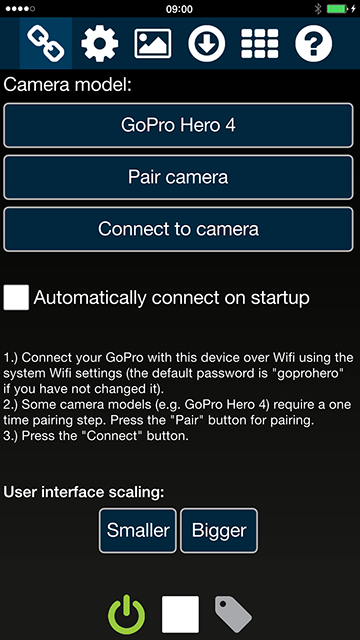 Camera Suite allows you to control action cameras such as GoPro Hero 2/3/3+/4 models over Wifi/WLAN. It supports full control over the camera, live preview, media browsing and changing of camera settings. 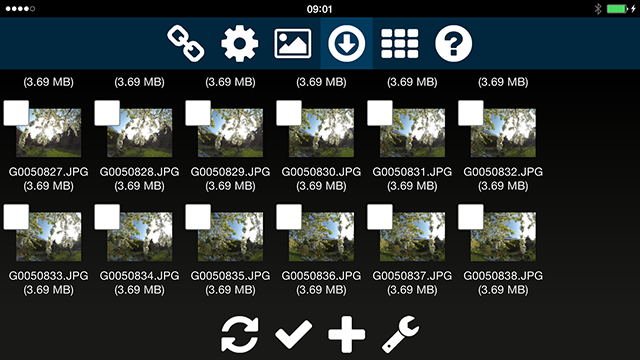 Camera Suite for mobile devices is currently available for Apple iOS, Android, and Windows Phone 8.1. Connect your mobile device to the GoPro Wifi network. The default Wifi password if you have not previously changed it is "goprohero". 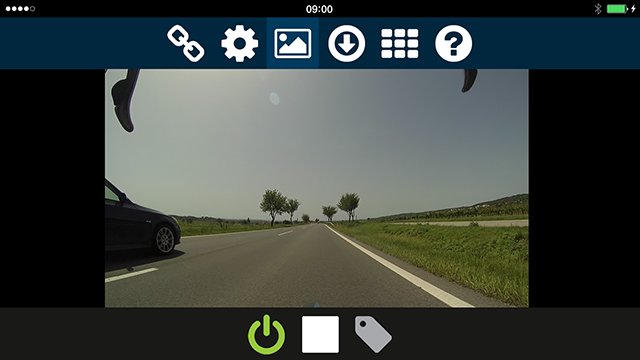 Start the Camera Suite app and select the "GoPro Hero 2/3/3+" entry. Connect your mobile device to the GoPro Wifi network (the SSID of the network looks like "GPxxxxx"). The default Wifi password if you have not previously changed it is "goprohero". 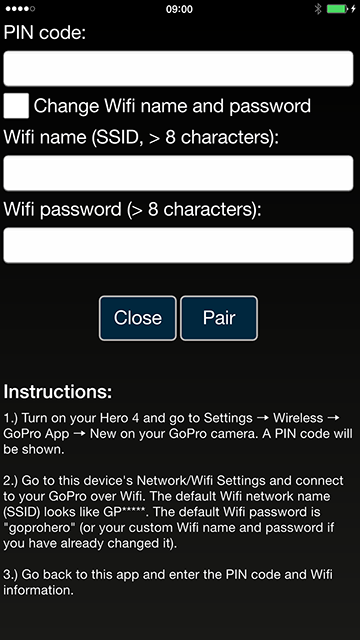 Connect your mobile device to the GoPro Wifi network using the SSID and Wifi password entered during the pairing process. The connection tab offers functionality to pair, and connect to a camera. It also provides means to change the user interface size to match your preferences. 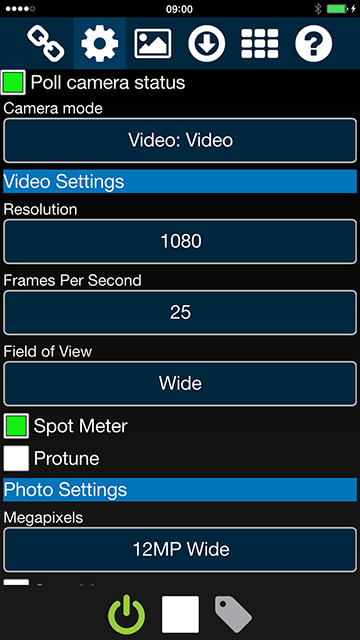 The settings tab shows all camera settings, such as resolution, mode, frame rate, protune, etc. which can be changed. The live preview tab shows the live preview. The live preview can be switched to fullscreen mode by double tapping on the screen. The remote browser tab shows the media files located on the camera. The local browser tab shows media files which are already downloaded to the local device. The info tab shows general app information and contains links to the app help. The power button turns the camera on and off. The camera is powered on when the button is green. It can take a few seconds to change the power state of the camera. The recording button starts and stops recording. The button is red during recording. The tagging button is enabled during video recording and adds tags to videos ("Tag moments"). This functionality is not available for all cameras. The connection view provides means to pair, and connect to a camera. Note: The camera has to be connected with the mobile device using the system Wifi settings before the app can be used. Pair camera: Opens a dialog for pairing a camera. Pairing is only required by some cameras (such as GoPro Hero 4 models). Connect to camera: Connects the app with the camera. Automatically connect on startup: Connects the device automatically to the camera when the app is started. User interface scaling: This options allows to modify the user interface size (e.g. buttons, controls, etc.) so that it matches your preferences. It is recommended to restart the app after changing the size. The settings view shows all camera settings. Poll camera status: If selected then the camera status is regulary polled from the camera. This results in additional CPU, and thus battery usage. If this option is turned off then the camera status is not updated. For instance, if the camera mode is changed directly on the camera then this status change will not appear in the app until the polling option is turned on again. The live preview shows the camera live preview. Some camera models (for instance GoPro Hero 3 cameras) disable the live preview during video recording. The live preview is not smooth for some camera models (e.g. cameras older than GoPro Hero 4) to minimize the preview delay. If the preview fails it might be necessary to restart the camera (e.g. remove both the battery and the USB cable) or to restart the Camera Suite app. Firewalls should be disabled if preview does not work. The remote browser view shows the media files located on the camera. It provides means to delete, preview, and download media files to the mobile device. Files can be select with a single tap and have a green rectangle while unselected files have a white rectangle. Double tap on file: Opens the file with the associated app (e.g. for streaming and preview). File information: Shows details about the file (such as size, date, etc.). Stop thumbnail loading: Stops the thumbnail loading. Play media file: Opens the media file (same as double tapping). The refresh button reloads the list of images from the camera. The selection button allows to select media files in batches (e.g. select all, deselect all, select only images, select only videos). Download selected: Downloads the selected files to the mobile device. The app should stay in foreground during download. Copy download links: Copies the download links of the selected files to the clipboard. This is useful if an alternative app (e.g. download manager or web browser) is used for downloading. Delete selected: Deletes the selected files from the camera. Deleted files cannot be recovered! Note: certain types of files cannot be deleted over Wifi (e.g. time-series, burst, some video formats) - this is a camera restriction. Download thumbnails: If checked then thumbnails are downloaded for each media file. If not checked, then only media information (filename, etc.) are retrieved. Legacy browser mode: The legacy browser mode uses a "hack" to download media files from the camera. In contrast to the "normal" mode the legacy modes shows all files but is slower than the "normal" mode. Newest media files first: If selected then the most recent captured files are shown at the beginning of the list. Delete online/offline thumbnail cache: Deletes the app's thumbnail cache. The thumbnail cache holds thumbnails of videos and images to improve performance and safely be cleared. The thumbnail cache can consume a considerable amount of storage and thus it is recommended to clear the cache from time to time. The local browser view shows files which have been downloaded from the camera to the mobile device. Files can be select with a single tap and have a green rectangle while unselected files have a white rectangle. Double tap on file: Opens the file with the associated app. 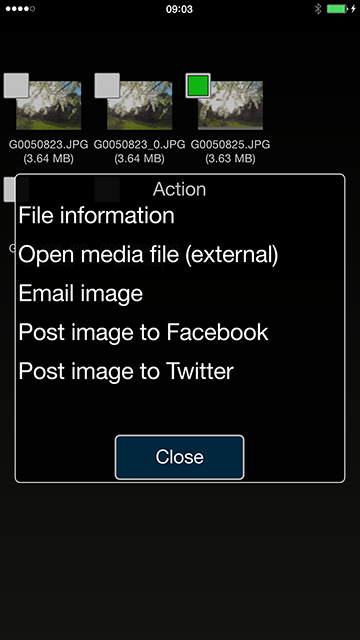 Open media file: Opens the media file (same as double tapping). Email/Facebook/Twitter (iOS 7 and newer only): Allows to email and share images. Share (Android only): Allows to use the file in another app ("Send intent"). The refresh button reloads the list of images. Delete selected: Deletes the selected downloaded files from the mobile device (not from the camera). Export to gallery (iOS and Windows Phone): Adds the selected files to the phone gallery. On Android files are automatically added to the gallery and are located on the external storage directory "Downloads/Camera Suite". The info view shows app specific information and offers links for contacting us and to this help site. This section describes platform specific notes. Camera Suite performs certain network operations in the background. It is recommended to exit the app with the Android back button after usage. If Camera Suite (or any other app) hangs then the app can be terminated by double pressing the Home button until screenshots of all open apps appear. An app can be terminated by moving the app screen to the top. If Camera Suite (or any other app) hangs then the app can be terminated by press-and-holding the Windows Phone Back button until screenshots of all open apps appear. The app can be termianted by pressing the "X" on the top right.